Though a man (plant?) 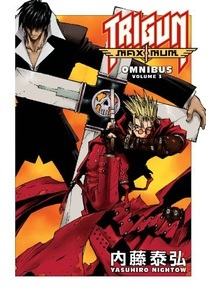 of peace, Vash the Stampede may be the deadliest gunslinger in the galaxy. But his brother, Knives, may be the deadliest creature in existence. Orchestrating a campaign of terror and destruction, Knives and his plant army are out to turn planet Gunsmoke into just that, and Knives may soon grow too powerful to be stopped - though Vash may die trying! Story and art by Yasuhiro Nightow.